"This was made by a German family that I stayed with for a few days, and I loved it! Use your favorite combination of herbs if you wish. Great with a loaf of homemade bread!" Arrange the tomato slices in a single layer in the bottom and up the sides of a deep dish pie pan. 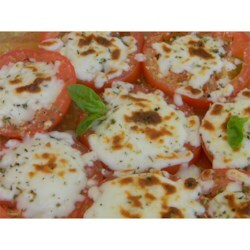 Arrange slices of mozzarella cheese in the center. Sprinkle with the Italian seasoning. Bake for 5 minutes in the preheated oven, or until the cheese is melted. Serve hot or cold. See how to make real German-style potato pancakes. Yum! Always delicious on bread! I wouldn't call this a pie. German? not really but it was good and we all enjoyed it. Thanks! With a simple variation of herbs, I made one casserole dish extra; no cheese, one drizzle of EVO, S+P, and some breadcrumbs. Yum! My guests and I :] loved this recipe. Thank you.